Wedding favours often seem a small aspect of any wedding, when you’ve fretted over the dress, the flowers, finding a good photographer and your hair and make-up, it might seem that the small bag of traditional sweets you give to your guests isn’t really that important. However, the wedding favours you choose play their part long after your actual wedding day is over. Wedding favours are that small reminder for your cherished guests that will bring the memories of your big day flooding back. There are loads of inspirational ideas that can help you choose the sweets included in the wedding favours for your big day and one of our favourites is to tap into the symbolism behind traditional wedding favours. Although many people are unaware of this, the little bag of sugar almonds which is so often found at wedding tables actually represent the couple’s hopes for their married life together: Health, Wealth, Happiness, Children and Longevity. So, while we’re happy to supply you with sugar almonds for your wedding favours, another way to represent your hopes and dreams for your life together is to substitute the sugar almonds with sweets that also represent the hopes of all newlyweds. You can choose any sweets in your wedding favours, to represent what you hope for your married life together - including of course all your favourite retro sweets. Here’s our suggestion of what to include in your wedding favours so you can capture all the sweet symbolism. 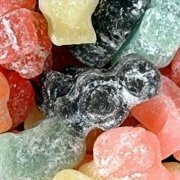 The delightful combination of aniseed and sweet sugar makes cough candy the perfect retro sweet to include in your wedding favours. The sweetness of this soothing mixture is the perfect representation of health that you hope the bride and groom will be blessed with. The second inclusion in our wedding favours are good old chocolate coins. 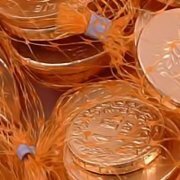 We all remember unwrapping these discs of sweet chocolate and what better way is there to represent the wealth the bride and groom hope to acquire during their married life? Every newlywed couple wishes that they will enjoy a happy life together. 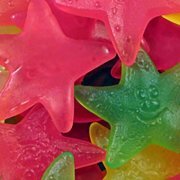 With their cute smiley faces and chewy, sweet goodness, Haribo Gummy Starfish are a fabulous ingredient in any wedding favours to symbolise the notion of the happy marriage that we hope the couple enjoy. Although not exactly identical, just like real babies, Jelly Babies are small and sweet. And because you can’t include the real thing in a wedding favours package, nothing better symbolises that the married couple will be blessed to hear the patter of tiny feet that Jelly Babies. Each marriage should ideally come to an end when either the bride or groom transitions from dearly beloved to dearly departed. 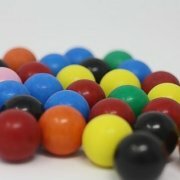 In the world of wedding favours confectionary, nothing symbolizes longevity more than the mighty gobstopper, indicating to all guests the happy couple’s desire for a long-lasting union. These are our choices for symbolic wedding favours packages. What hopes would you want to symbolise and what sweets would you choose?